Pro Se Productions announces the latest release in author Alexander S. Brown’s Pro Se Sing Shot Signature Series-The Night the Jack O’ Lantern Went Out. Halloween. A holiday that inspires memories, excitement, and a little bit of fear in everyone. A single day where all the ghosts and ghoulies come out to play and sometimes its hard to tell which of the creepy crawlies are human and which ones truly rise from beyond seeking unsuspecting souls. Author Alexander S. Brown explores all the wonderfully terrifying possibilities Halloween has to offer in his Pro Se Single Shot Signature Series- The Night The Jack O’ Lantern Went Out! Each month Brown delivers a new short story of terror laced with just enough nostalgia that makes us all hope Halloween comes sooner…and stays far enough away that the monsters don’t get us! Brown’s fourth tale, ‘Faceless’, frighteningly shows how thin the life between myth and reality may be, especially around Halloween. A child’s plaything makes demands on a mother that force her to do the unspeakable. What happens when a parent doesn’t do everything possible to make their child happy at Halloween? Find out in ‘Faceless’. 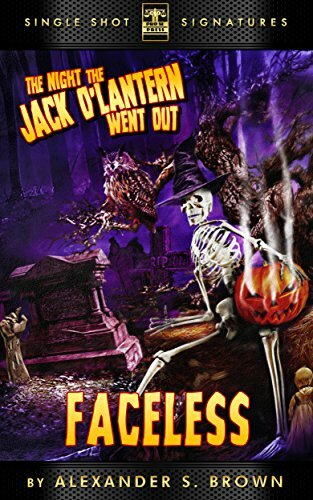 The fourth short story from The Night The Jack O’ Lantern Went Out is available for only 99 cents on Kindle at http://tinyurl.com/pkf2y8f and for most platforms at http://tinyurl.com/pfep2t8.